Among the international visitors to Leicester's Morningside Arena this weekend will be a delegation led by Kenji Kitahashi, the mayor of Kitakyushu, a city which will host Great Britain’s training camps for the World Wheelchair Rugby Challenge, the Paralympic Test Event and the Paralympic Games in 2020. GB will grant open access to training camp to the citizens of Kitakyushu and also carry out community liaison in the region as part of an initiative to be signed over the course of the weekend in Leicester. Mr Kitahashi, 65, will watch the Japan v France game in Leicester before attending a formal dinner at the King Power Stadium with Leicester’s Lord Mayor, Ross Grant. “It’s an enormous honour to welcome Mr Kitahashi and delegates from Kitakyushu to Leicester,” said David Pond, CEO of Great Britain Wheelchair Rugby. 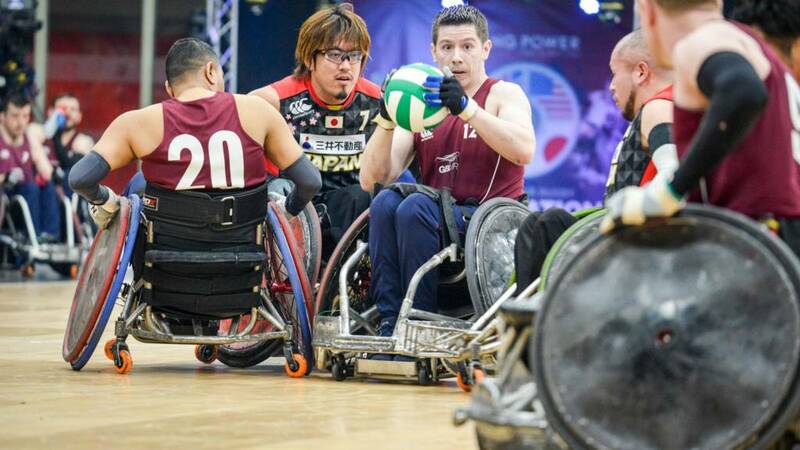 ”I am looking forward to taking wheelchair rugby to Kitakyushu and for its citizens to enjoy an incredible sport played by incredible athletes”. Later this year, the city of Kitakyushu will also host the Wales team in the group stages of the Rugby Union World Cup. Wheelchair rugby teams are made up of four players on a court at any one time, although 12 players are allowed in a team overall. Teams are mixed, made up of both men and women. They are played over four quarters, each lasting eight minutes. All wheelchair rugby players are quadriplegic and men and women can play on the same team. A goal is scored when an athlete has possession of the ball and crosses the goal line of the opposing team, with two of his or her wheels. Contact between the wheelchairs of the players is allowed, although fouls can be given for dangerous contact such as hitting an opposing player’s chair behind its rear wheels to cause it to rotate. Body contact between players is penalized with a one-minute penalty. Players can only carry the ball for 10 seconds before dribbling or passing it and teams in possession of the ball have 40 seconds to score a goal. There is a restricted area at each end of the court. The ball can be passed forwards. If there is a tie at the end of the four eight-minute periods of play, overtime is played in three-minute periods until there is a winner. How can I watch the Wheelchair Rugby Quad Nations? The BBC will bring you coverage from all three days of the Wheelchair Rugby Quad Nations on the BBC Sport website and app, Connected TVs and on the BBC iPlayer, where you can also catch-up on the event shortly after each broadcast. What is the Wheelchair Rugby Quad Nations? The second edition of the Wheelchair Rugby Quad Nations returns to the Morningside Arena in Leicester. A round-robin style tournament sees four nations compete in a mini-league to determine the line-up for the gold and bronze medal matches. This year's line-up, joining host nation side Great Britain, will be Japan, who won the Gold medal at the World Wheelchair Rugby Championships held in Sydney this summer; Canada, currently ranked fourth in the world with seventh ranked France completing the list. Last year, United States won the inaugural tournament by defeating Australia 56-55 by a single point, whilst Great Britain suffered at 45-41 defeat to Japan in the bronze medal match. The tournament will act as preparation for Great Britain who are looking to defend their European Championships in Denmark this August. Originally called 'murderball', the game was hugely popular at both the 2014 Invictus Games and the London 2012 and Rio 2016 Olympic Games. The aim of Wheelchair Rugby is to score goals by carrying the ball across the opposing team’s goal line. In order to score a goal a player must cross the goal line with at least two of the four wheels on their wheelchair while in possession of the ball. Each match consists of four quarters of eight minutes with matches lasting 80-90 minutes. Teams can be made up of both men and women, and it is incredibly competitive. The Great British Wheelchair Rugby site has a club finder, and even gives you the contacts to start your own.